"Good Morning Union Station, we 'll be serving ur lunch today. 11:30-2:30 see u soon!!! @ Washington, District of Co... https://t.co/3GUCtHYq9V"
The food was really good and flavorful. I ordered the the special because it seemed easy but everything that was being passed through the window looked fantastic. I will be exploring the next time I see the truck. Just a warning, they are a bit slow compared to other trucks. I just tried the three taco combo and it was excellent. Tacos may have been a temporary or new offering. Quality ingredients, the tilapia was breaded and fried yet still light, the pork had a nice smoke flavor, and all the meats were extremely tender and flavorful. I will have to try some of the tapas next time. They are fast, polite, and resonably priced. I had the sweet corn fritters they were crispy on the outside and sweet soft on the inside. The popcorn chicken are large and flavor ful (definitely ask for extra sauce)pairs very well with the garlic fries. We enjoyed our fries and fritters. The food was tasty, hot, fresh and there was plenty to share. Adding them to trucks I follow right now! Picture microwaved food from the grocer's frozen section. The customer service was great! They called me by name when the food was ready. The food was lukewarm when I received it. The calamari and the shrimp tasted like they came from the freezer section in the grocery aisle. It was not fresh at all; the texture of the meat was as if at had been reheated a few times already. Also, the shell was still on the tails of the shrimp beneath the breading--what an unpleasant surprise! The flavor of the garlic fries was okay, just not crispy enough, and again, they tasted like they were sitting around and then reheated. The rice was just okay too. I will not be returning. Very good food, may be just need to have more food options. 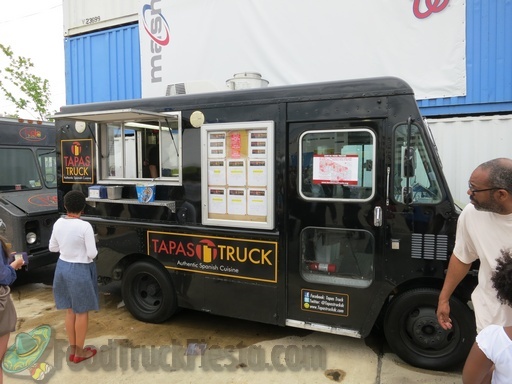 Tapas Truck is created by the makers of Mojo Truck. The truck went into service on March 30, 2012 and serves in DC. On the menu are traditional tapas as well as original recipe tapas.